AsiaNews Report: Huge turnout for marches against the USA and in support of the leadership. The death toll rises to 23 dead and 450 arrests. Khamenei: External "enemies" who want to foment chaos and target institutions. Zarif: Security and stability depend on the Iranians, free to "protest and vote". Poverty and unemployment are the fundamental reasons for the demonstrations. Tehran (AsiaNews) - This morning, tens of thousands of people took to the streets in different cities, in the context of a massive campaign to support the government and the religious leadership of the Islamic Republic, amid days of violent protests. According to state TV, at least 23 people died in the clashes that led to the arrest of over 450 people. Citizens marched through the streets of some of the country's most important cities, including Ahvaz (south-west), Kermanshah (west) and Gorgan (north). Many chanting slogans such as "leaders, we are ready" and others against the United States ("death to America") and Israel. The demonstrators waved flags of the Islamic Republic and held posters with the face of the supreme leader, the Ayatollah Ali Khamenei, and the words "death to the seditious". This morning’s demonstrations follow a night of relative calm in the capital, Tehran, the epicenter of the protests in the previous three days. Behind the uprising, promoted above all by young people - the average age of those arrested is 25 - the economic problems and austerity measures launched by the executive, including cutting social spending and rising food and fuel prices. President Hassan Rouhani spoke of a "small minority" of people who foment the uprising, adding that it will be the people who will respond to them adequately. He has not excluded the mobilization of millions of people to stop the protests. Yesterday, for the first time since the beginning of the protest, the supreme Iranian leader, the Ayatollah Ali Khamenei, intervened, pointing at the "enemies" of Iran who are outside the country. The Shiite leader claims that these would have "strengthened the alliance to hit institutions" of the Islamic Republic and of trying to exploit "the opportunity" to foment chaos. Without mentioning them directly, the great ayatollah spoke of external enemies who "used different instruments", including "money, weapons, politics and espionage to create unrest". "In due course - concluded Khamenei - I will speak to the people about recent incidents". Meanwhile, the international pressure on the institutional leaders is rising, to avoid the repression of the protests in blood. In a note, the European Union (EU) expresses concern over the escalation of violence and ensures that it "closely follows" the demonstrations underway "and the" unacceptable loss of human life ". The United States is insistently calling for a meeting of the United Nations Security Council, while the French Foreign Minister has decided to postpone his visit to Tehran scheduled for January 5 and 6. Videos posted on social networks reveal images of demonstrators trying to assault a police station in the central town of Qahderijan. According to state television, six of the nine victims registered in the area were people trying to steal weapons and ammunition from the barracks, located in the province of Isfahan and about 350 meters south of the capital. Iranian Foreign Minister Mohammad Zarif recalled that Iran's security and stability depend on its own population. Commenting on the government protests, Tehran's chief of diplomacy - the great architect of the 2015 nuclear agreement - spoke of people who have "infiltrated" peaceful protests. 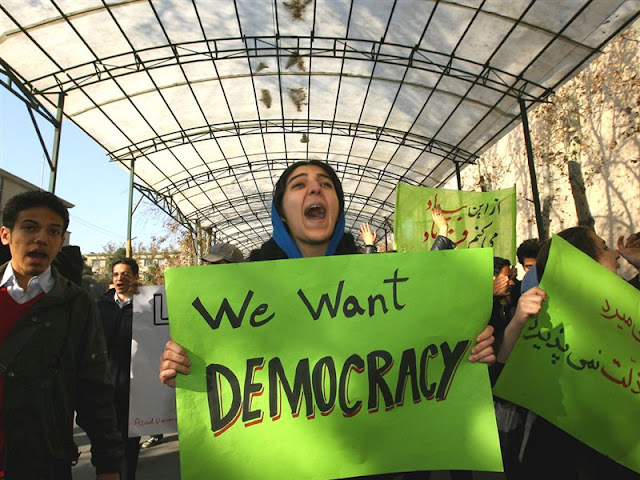 He added that they will not be allowed to "violate the rights of the Iranians", who are free "to vote and to protest".